Chicken anti Human, Mouse, Rat ECRG-2. Product is tested for Paraffin Sections, Enzyme Immunoassay, Western blot / Immunoblot. Positive Control: Human lung tissue lysate. 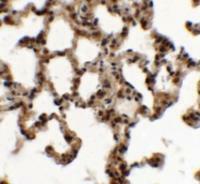 Immunohistochemistry on Paraffin Sections: Start at 5 µg/ml. The esophageal cancer-susceptibility gene 2 (ECRG2), also known as SPINK7, is a novel tumor suppressor gene identified from the human esophagus. It interacts directly with metallothionein 2A and urokinase-type plasminogen activator (uPA), and downregulates the activity of uPA, leading to reduced cancer cell migration, invasion and metastasis. ECRG2 forms a complex with uPA and its receptor uPAR, modifying the dynamic association of uPAR with beta1 integrins and disrupting the Src/MAP kinase pathway that normally stimulates cell migration and invasion. 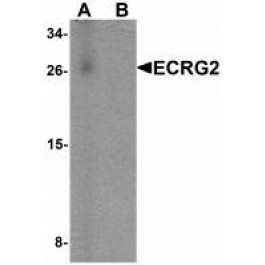 ECRG2 may thus represent a novel therapeutic target for cancer. Cui Y, Wang J, Zhang X, Lang R, Bi M, Guo L, et al. ECRG2, a novel candidate of tumor suppressor gene in the esophageal carcinoma, interacts directly with metallothionein 2A and links to apoptosis. Biochem Biophys Res Commun. 2003 Mar 21;302(4):904-15. PubMed PMID: 12646258. Huang G, Hu Z, Li M, Cui Y, Li Y, Guo L, et al. ECRG2 inhibits cancer cell migration, invasion and metastasis through the down-regulation of uPA/plasmin activity. Carcinogenesis. 2007 Nov;28(11):2274-81. Epub 2007 Jun 29. PubMed PMID: 17602171. Store undiluted at 2-8°C for one month or (in aliquots) at -20°C for longer.